St. John’s, Malta, November 2, 2018 — Phore Blockchain, a leading blockchain platform and ecosystem focused on real-world use, announced today that it’s digital asset, Phore (PHR) will be listed for trading on the Ternion Exchangeupon its launch on November 15th. The PHR listing will go live on the exchange with a PHR/Bitcoin pairing followed by a PHR/USD fiat pairing in January 2019. Ternion is only the second exchange in the world to be licensed by the European based Financial Intelligence Unit (FIU). In addition, both Phore and the Ternion Exchange are committed to providing unprecedented levels of security to its users. Both licensing and strong security are important building blocks for growth as blockchain markets move into a more regulated global environment. “We continue our support of promising and revolutionary projects like Phore Blockchain, that are aiming to make a feasible impact on the market by fostering easily accessible pathways towards cryptocurrency and blockchain adoption,” said Rudolfs Medvedevs, CEO of Ternion. “We are very happy to partner with the Phore team and to list PHR on the Ternion Exchange. We look forward to aligning our business interests and actively participating in the vibrant ecosystem that Phore is creating.” “Ternion has a clear capacity to be one of the leading exchanges in the world,” said Anthony Alleyne, Co-CEO of Phore Blockchain. “In my opinion it will also be one of the few operational gateways for institutional investment in 2019. 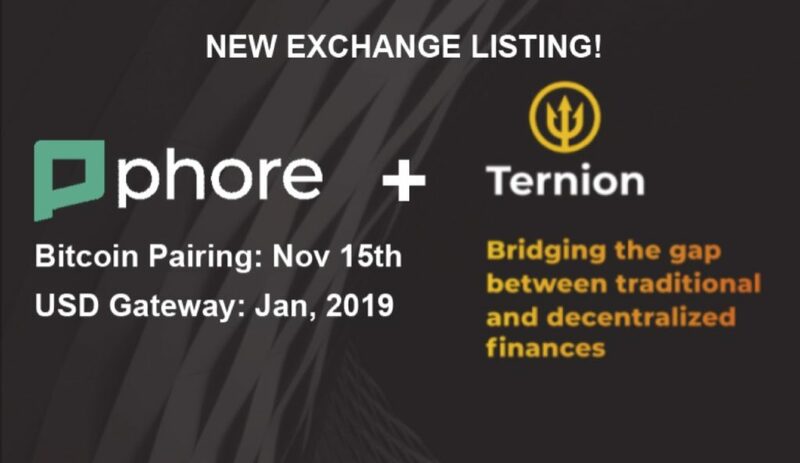 Rudolfs’ endless drive and ambition is inspirational and I’m honored that Ternion will be initially launching with Phore, and providing a direct fiat gateway for it in early 2019.” Phore’s listing on Ternion will be accompanied by a marketing campaign that will include two promotional PHR Airdrops on the Exchange between November 2018 and January 2019. Phore will also host an “Ask Me Anything” (AMA) session on its Discord social media channel with Mr. Medvedevs, in early December. The AMA will answer questions from the community and cover why the Ternion Exchange is different and outline the benefits for both traders and investors. 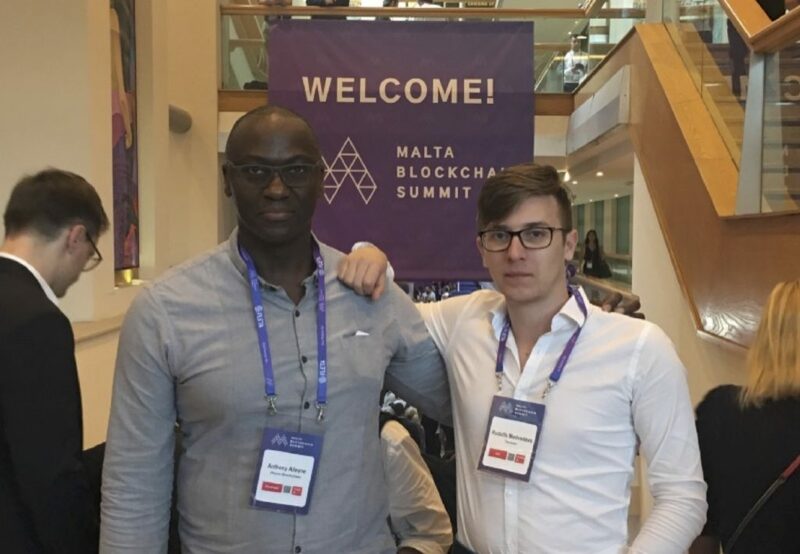 Anthony Alleyne, Phore Co-CEO and Rudolfs Medvedevs, CRO, Ternion at the Malta Blockchain Summit, November 2018. Phore Blockchain enables the transfer of value across an accessible, standardized ecosystem, which is secure, flexible and scalable. 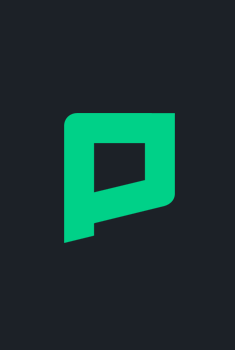 The platform supports a variety of applications, ventures and a growing range of capabilities, including reliable and fast transactions that are either transparent or private, rewards for network participation, a decentralized marketplace, and Phore Synapse Smart Contracts. Phore Blockchain also offers custom blockchain technologies and services for B2B clients. Learn more at phore.io. Ternion is a hybrid licensed cryptocurrency exchange with a fiat gateway and integrated merchant services platform. Blending the security of both traditional financial and cryptocurrency platforms, Ternion is designed to serve retail and institutional investors seeking to interact with blockchain markets in day-to-day activities. Learn more about our mission and team at ternion.io.